Gross Area: 14,888 sq. ft.
Area Per Student: 496 sq. ft. The new cutting-edge Lasch Family Golf Center serves the highly ranked men’s and women’s golf programs at Michigan State University (MSU). 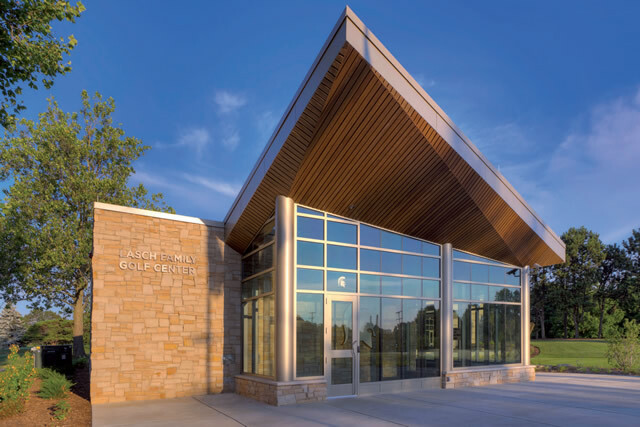 The center is located next to Forest Akers West Golf Course and offers an iconic, sophisticated, and welcoming home for training, studying, and socializing. This 14,888 square-foot training center replaced the Rearick Golf Center and features an indoor putting zone, team locker rooms, offices for two head coaches and two assistant coaches, and a modern student-athlete lounge. It also offers a high-tech simulation room, weight room, and kitchen area featuring nutrition and hydration stations. A striking angular roofline, glass curtainwall, and a softly glowing Spartan logo greet visitors at the main entrance. An abundant use of glass wraps around the adjacent outdoor Fox Family Putting Green, conveying the lush, natural element of the outdoors throughout. Warm toned cherry wood ceilings extend in a single plane from exterior soffits directly into interior planes. Large format porcelain tile used throughout the Center withstands golf cleats and bags while resembling natural stone. The lounge features multiple spaces to study, eat, and congregate. Multipurpose tables can be used for studying, dining, or even as small buffets. An adjacent kitchen transforms the space into a venue for team gatherings and other social events. Wood tones blend with subtle earthy greens and Spartan logos, giving the feel of a sophisticated golf club. Trophies and awards are tactfully displayed on glass shelves. 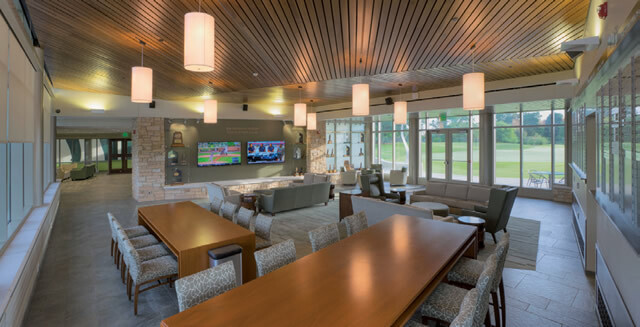 Michigan State University was looking for a design that reflected MSU Athletics and did not feel like a traditional “clubhouse.” The new facility delivers a modern clubhouse environment and gives a new face to the MSU Golf program. The Center is nestled into the surrounding trees to reduce the scale and impact of the facility when viewed from the nearby golf course. Exterior materials embody natural tones including stone, glass, and burnished block. The design team incorporated transparency throughout the space to add a sense of place. Repeated, subtle use of Spartan logos evokes team pride at every turn. Similar to outdoor golf settings, natural light is abundant and natural views take center stage. Student-athletes benefit from the glass entry, numerous windows along the main corridor, and clerestory windows that are featured in the indoor putting green. Site placement and views make users aware of the surrounding golf course and allows students to easily walk in and out of this building at different points to practice either inside or outside. The planning process involved a solid team effort from the start. The design team, construction manager, and MSU’s Infrastructure Planning group collaborated to meet the project goals and challenges. Design meetings were productive and decisive. The Construction Manager joined the project early in the design process to improve pricing and timeline efficiencies. Planning also had to include meeting the mark on the schedule in order to open in time for the start of the golf season. A schedule solution that saved weeks was issuing the structural package as design-assist, with steel being a long lead item that benefitted from being awarded earlier. It allowed the supplier to get the steel into production earlier than if they had waited for complete drawings. MSU’s attentive staff aided the design and construction processes by answering questions and addressing concerns promptly. One of MSU’s goals was to give the building more visibility. The former facility could not be seen from the roadway, and there was no presence of the Golf program. The new facility offers a distinct vision of Golf as people drive in. MSU envisioned a building that would not be a clone of an old clubhouse. They wanted a building that combines the intimacy of a traditional clubhouse with the modern look of other MSU’s athletic buildings. The design exudes the Golf lifestyle in refined ways. The front entry has an angled wood soffit sculpted in multiple planes, reminiscent of the shape of the head of a golf club. The design team collaborated with MSU on multiple versions to determine the appropriate image for the facility, and the result is nothing short of a memorable Golf headquarters. A spacious lounge connects interior spaces while offering patrons views throughout the building, as well as granting access to the outdoor putting green. The site also includes the "Three Moons Rising" sculpture by Jeff Kahn, the first wind-driven sculpture at MSU. In addition to locker rooms, offices, and a lounge, this facility offers multiple options for student-athletes to improve their focus and golf game. A high-tech simulation room is equipped with a golf simulator, allowing student-athletes to virtually play on any golf course in the world. Technology records and analyzes a player’s swing for instant feedback. An indoor practice area offers year-round training possibilities. 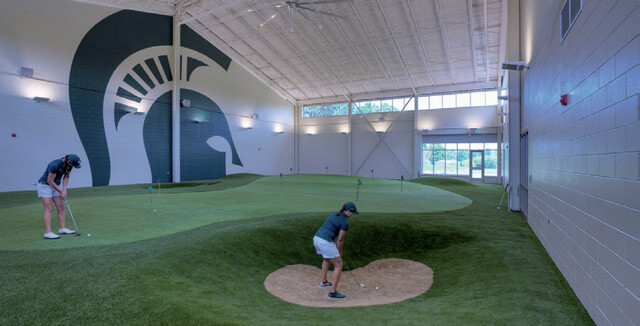 The 5,000 square-foot indoor practice green was designed to Michigan State’s terrain specifications and can be re-graded to offer limitless options. The design of this facility incorporated modern and sustainable design efficiencies wherever possible. As the nation’s first land grant university in 1855, Michigan State University has an entire specification section on tree protection. Due to the nature of the project and the site, the design and construction team successfully protected nearby trees and golf turf throughout the course of the project. For instance, during construction the team had to direction bore anything near the trees and putting green located in close proximity to the building site instead of open trench. Although generous private donations made the facility possible, the design team still had to design within a budget. Conscious choices of colors, materials, and finishes seamlessly blend expensive and cost effective elements. The design was based on an organic, grounded connection with nature. A main goal of material selection for this project entailed achieving a natural look at a reasonable cost. The building relates to the site in an organic way, with a portion of the building featuring natural limestone, a material cropping directly out of the site. Designers chose exterior concrete pavers in lieu of stone for the outdoor patios. From the skylights to the carpeting and wood lockers stamped with the Spartan logo, the locker rooms lend a country club ambiance to this student-athlete space while meeting budget. A majority of the indoor flooring is a durable, porcelain tile reminiscent of stone, which withstands golf cleats while achieving the desired aesthetic at a more reasonable price than comparable natural stone. Each Locker Room offers unique styling for the Men’s and Women’s Team including carpets, wall covering, glass tile mosaics, and hardware. Oak, maple, and cherry wood were used with various stains to identify areas within the building. Designed with the golfer in mind, the bag-sized lockers feature perforated lower panels to promote ventilation. The shower area has porcelain tile floors that look like wood, porcelain tile walls that resemble stone, and countertops composed of an engineered stone product, all of which produce a spa-like feel while meeting the required durability. Glazed glass shower doors feature the Spartan logo. For budgetary control, the indoor practice area is formed of two-tone, ground-faced CMU in lieu of limestone. Designers considered that in the indoor practice area, students are focused on golf itself rather than being aware of the actual building. Designers transitioned to less expensive materials in these types of spaces and reserved the use of limestone and wood for high-profile places such as the lounge. Due to the nature and function of the building, the site was an integral part of the design from day one. The constraints of the adjacent putting green and nearby tree lines impacted both design and construction maneuverability. Designers fully integrated the facility into its natural surroundings by curving the building around the green. Careful, regimented planning went into each step of design and construction to protect nearby natural elements. The new facility is mostly usable square footage with very little circulation space. The main hallway curves with the building as it hugs an adjacent outdoor putting green, allowing ease of circulation between all interior spaces and direct access to exterior functions from multiple points. Interior and exterior glass offers direct views of all major areas from the coaching offices. Client feedback on the new facility has been overwhelmingly positive. Despite a tight schedule and a host of challenges, the new home of Michigan State Golf not only enhances future recruiting opportunities, but also strengthens and enriches the total student-athlete experience. Beautifully designed building. I like the way it sits on the site; nicely articulated. Overall, well done.